It’s that time of year again when love hearts are everywhere and pink recipe ideas pop up around the internet. My Frenchman is normally romantic throughout the year so Valentine’s Day usually comes and goes without flowers – even restaurants are avoided, since they’re supposedly busier than usual. 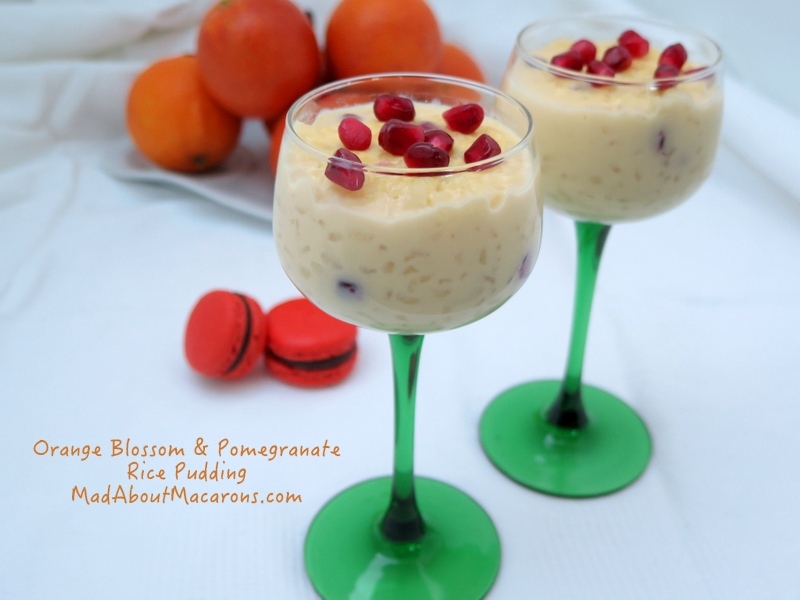 So I make our own Valentine’s desserts, such as this creamy Orange Blossom Pomegranate Rice Pudding. “It’s so commercial”, he says. Typically French that is; and I’m supposed to shrug my shoulders and say, “But of course dahlink, who needs Valentine’s Day?” I do say it sheepishly but with a frog in my throat. The French would say “with a cat in my throat”. Baah! Hang on. I should be the cat; he should be the frog, no? Antoine adores his rice pudding – especially this creamy recipe that he often enjoys chilled for breakfast. This time, I’ve revisited it with a seasonal touch of fragrant orange blossom and crunchy pomegranate seeds for an easy yet deliciously healthy Valentine’s dessert. Did you know all these wonderful health benefits of Pomegranates? Egg yolks give that extra silky creaminess and they’re a great source of iron too. For those of you who prefer a touch of pink in your desserts next Valentine weekend, then add some of the pomegranate juice and stir it just before pouring into individual glasses. Ideally, serve with macarons! Here, I served the desserts with chocolate orange blossom macarons and rose-orange blossom macarons, both from Teatime in Paris. Fill a large saucepan with water. Add the rice and bring to the boil. Once boiling, cook for a couple of minutes then drain the rice in a sieve or colander. Pour the milk (whole, full milk for best creaminess) into the large saucepan. Add the orange blossom water with 25g of the sugar. Rain in the rice and simmer gently for 15 minutes, stirring occasionally so that no skin forms on the milk. Add a handful of arils (pomegranate seeds). Stir now and again as it heats gently for about another 10 minutes. Check that the rice is cooked but not mushy. In a bowl, whisk together the yolks with the rest of the sugar until it’s light and creamy. Add the hot rice and mix well. Continue to stir in the yolk mixture for a minute then take off the heat (so not to overheat and curdle the yolks). Don’t worry if it looks a bit liquid, it will thicken as it cools. Pour the rice pudding into individual stem glasses. Set aside for about an hour and enjoy while still warm. Thank you for sharing the recipe! I’ve never tried making rice pudding, it sounds interesting. I eat pommie seeds everyday to keep colds away and it works. But this is far more delicious! Must try!! Well so far so good on your pomegranate seed tip Carol. Hope you try this! This is too funny as my husband used to want to take me out on Valentine’s Day and I’d say it’s too busy! He’d come home with flowers and I’d tell him that they were too expensive, and now he’s stopped (after 25 years). I’d rather spend the money on a trip! haha! Now, regarding that rice pudding: I’ve never tasted rice pudding with egg or yolk in it and am trying to imagine how it would taste! I suppose I have to try it to see! Of course the orange blossom water would be sublime, and pomegranates are my favorite fruits!! Maybe I’ll have to give this a try next time! Poor Bob! No wonder he stopped – but I see where you’re coming from; must be your Mediterranean and Scottish roots! Thanks Christina, I hope you try it with the yolks. It makes it extra creamy without the cream, giving it a rich golden colour. I had no idea that egg yolks had more iron content than beef so it’s good for us too. Jill – this sounds so incredibly special! I love orange blossom water in just about anything! Thanks David. We think the same way. I put it in semolina for a tagine, in brioche, in crêpes… yes, it’s a magic ingredient. Ah, my Frenchman bah-humbugs Valentine’s Day too, although he sometimes does something for me on the day because he knows I love it. He always says “I don’t need some American commercial enterprise to tell me when and how to show my love for you! And…. my Frenchman loves rice pudding (as do I) – and he also eats it for breakfast! This orange blossom and pomegranate version sounds wonderful and it looks perfect! Too funny Jamie – Jean-Pierre and Antoine are so alike. And have to admit, they’re right. I’ve never understood the chilled rice pudding at breakfast but hey, whatever turns them on!